Don’t Have A Chimney Cap? Here Are The Top Reasons Why You Need One! Despite Chicagoland’s harsh winters, some homeowners rely on their modern HVAC systems over their fireplaces for heat and comfort. Conversely, there are many residents who rely on this hearth to keep their home at an ideal temperature no matter what the weather brings. Regardless of its usage, your chimney still requires a cap. This critical element helps to protect your home and your family, and it must be in good working order for the best results. If you find yourself in need of quality chimney repairs in Chicago, the team at Elite Chimney & Masonry is here and ready to help. Since 1998, our caring team has worked to deliver the best services for each of our customers, from simple chimney inspections to flue repairs, chimney lining replacement, and more. Illinois residents who do not utilize their fireplaces often do not worry about the status of their chimney caps. 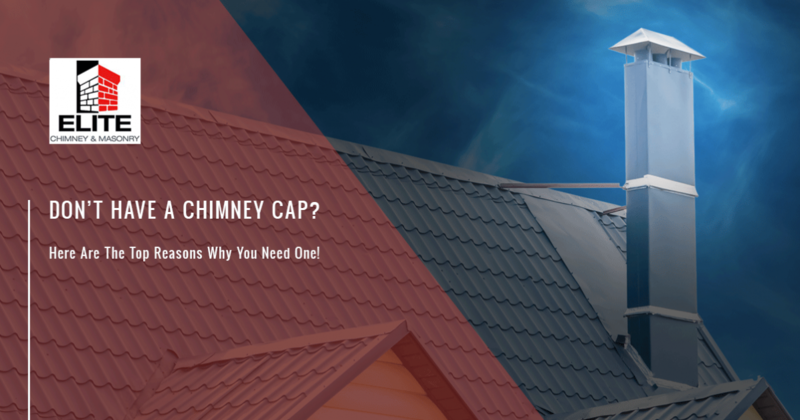 Today, we’ll highlight the top reasons why a cap can benefit your home, as well as the value that our chimney contractors can provide throughout the entire process. Numerous organic elements can make their way into your roof and your gutters. Those without a chimney cap may find sticks, leaves, and other debris decomposing in their fireplaces and flues. This may only seem like an aesthetic nuisance, but keep in mind that natural materials tend to effectively harbor moisture. Branches and leaves can begin to break down, incubating dampness to allow for numerous problems. Decomposing elements can provide serious support for moisture, putting these molecules in direct contact for faster material degradation. As you will learn throughout the chimney repair process, wetness is often the biggest culprit. A chimney cap does much to block water from entering the chimney. If your Chicago home does not have such a cap in place, rain and snow can enter at will. The damper above your fireplace should work to block moisture from entering your home and rusting the metal guards, but water buildups can still occur within the flue. Water carries a slight positive charge while oxygen leans to the negative side. This means that H2O works to dissociate ions by attracting the opposite styles. When it comes to your mortar and masonry, this results in a breakdown of solvents and material stability. Temperature changes can also create major moisture concerns. Our extreme temperatures result in expansion and contraction as water freezes and thaws out. Unfortunately, this expansion results in cracks and breaks that can become far worse if not proactively treated. Mold can grow in the right conditions. If you do not have a chimney cap on your home, heavy rainfall can help to create the perfect environment for this toxic organism to flourish. Homes with heavy mold damage often face costly and time-consuming remediation services, as airborne toxins can create a host of problems for the inhabitants. These repairs may be extensive in nature, hurting your bank account and making you wish you had invested in a chimney cap for your Illinois home. Our chimney waterproofing experts can help you to find the perfect fit for your chimney and your budget. The quality of your chimney cap will depend entirely on how perfectly it fits on your home. Many homeowners have heard that these valuable devices cause drafts, but when installed properly, the opposite is true! Homes with uncomfortable drafts may be dealing with the results of an improper size or installment. Oftentimes, this problem can be remedied by working with a professional chimney repair company to provide your Chicago home with an ideal fit. Call us today to learn more about this benefit! One fact about the design of your chimney is that many animals love it. Vermin love small, secure, dark spaces, and the flue in your house serves as a perfect home for them. Any critters residing within your chimney can pose a serious threat to your safety and the integrity of your home. Animals inside the chimney will eat and produce waist accordingly, disrupting the quality of your air and creating serious environmental concerns. Between the smell and cost of pest removal, we recommend installing a chimney cap instead! Elite Chimney & Masonry is proud to be your trusted team for chimney repairs in Chicago and beyond for 20 years. Our reliable team strives to deliver honest, affordable results that benefit your property for the long haul. Contact us today to learn more or to schedule your chimney inspection!